Two Nigerian most valuable artistes, Davido and Wizkid who had been on a long-term supremacy tussle fueled by social media rants have decided to put behind any show of enmity and embrace each other by teaming up together on stage to deliver a very energetic performance at just concluded Wizkid Live In Concert held at Eko hotel in Lagos. 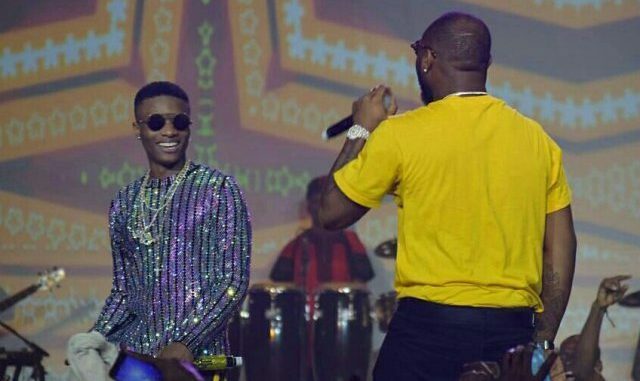 The moment Davido jumped on stage on Wizkid’s invitation at the concert appeared to be a surprising moment for thousands of Nigerians present at the venue as they both performed Davido’s song “FIA”. Recall that both artistes had earlier downplayed the issue of rivalry between them in their media appearances before the concert despite series of shades they’ve both thrown at each other on social media this year. Was there ever a beef between them in the first place? Was the whole beef issue a deliberately planned work to make both artistes centre of public discussion, thereby placing them above every other artiste in the industry? And some homies were already breaking bottles on their behalf.